#1. This week's number one is an experienced international center Gustavo Ayon (207-85, college: San Jose St., currently plays in Spain). He could not help Real Madrid (14-5) to beat Unicaja Malaga (12-7). Ayon recorded 7 points and grabbed 10 rebounds in 19 minutes on the court. Real Madrid was edged 103-102 on the road by the lower-ranked (#5) Unicaja Malaga. It was Real Madrid's first loss after three consecutive victories. It's Ayon's fifth season with the team. This year he averages: 7.3ppg, 6.8rpg, 2.5apg, 2FGP: 61.8%(42-68) and FT: 55.0% in 13 games he played so far. Ayon is currently a member of the Mexican senior national team. #2. Second place goes to an international guard Francisco Cruz (190-89, college: Wyoming, currently plays in Basketball Champions League). He was not able to help Baloncesto Fuenlabrada (4-10) in their last game on Wednesday. Despite Cruz's very good performance the eighth-placed Baloncesto Fuenlabrada (4-10) was defeated 85-78 in Panevezys by the higher-ranked Lietkabelis (#5) in the group C of Basketball Champions League. He was the top scorer with 26 points. Cruz also added 4 passes. The Regular Season already ended in the Basketball Champions League. Cruz has relatively good stats this season: 13.0ppg, 2.4rpg, 2.8apg, 2FGP: 56.8%(42-74), 3FGP: 43.4% and FT: 76.2%. Ex-Fuerza Guinda Nogales player is in the roster of the Mexican senior national team. #3. The Mexican player who performed third best last week abroad was an international point guard Alexander Perez Kaufmann (191-93, agency: Pro Sports, currently plays in Turkey). He was not able to secure a victory for Banvit (6-10) in their last game. Despite Perez Kaufmann's good performance Banvit lost 74-82 on the opponent's court to the higher-ranked (#5) Gaziantep. He scored 14 points in 34 minutes. They ended the series of four consecutive victories. This year Perez Kaufmann has relatively solid stats: 12.1ppg, 2.3rpg, 5.4apg, 2FGP: 54.5%, 3FGP: 28.2% and FT: 82.8% in 16 games. Ex-Soles de Mexicali player is also a member of the Mexican senior national team. #4. Point guard Paul Stoll (180-85, currently plays in Israel) couldn't help Maccabi Ashdod (12-5) in their last game on Saturday. Despite his very good performance Maccabi Ashdod was defeated 104-94 in Jerusalem by the lower-ranked Hapoel (#3). Stoll recorded a double-double by scoring 16 points and making 10 passes. He also added 4 rebounds. Stoll has individually a very good season with high stats. He averages: 17.9ppg, 3.9rpg, 7.1apg and 3.4spg. Stoll is a naturalized American. He is also Mexican national team player. Stoll used to play for Algodoneros de La Comarca - Torreon in Mexican league. #5. Former University international point guard Bryan Urrutia (185-97, currently plays college basketball in the States) led Md-E Shore to a 2-point victory against the South Carolina State University (2-2) 63-61 in the NCAA last Saturday. He recorded 22 points and added 9 assists in 35 minutes. The Univ. of Maryland Eastern Shore has 1-4 conference record this season. 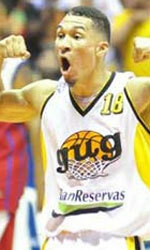 This year Urrutia's overall stats are: 7.0ppg, 3.4rpg, 5.5apg and 1.5spg in 22 games. He used to play for the Mexican university national team two years ago. #6. Guard Rene Melendez (193-96, currently plays in NAIA) managed to help Mayville State University to win against the Dakota State University crushing them 90-47 in the NStar on Friday night. Melendez scored only 3 points. It was his first game for Mayville State University this season. It was the game of the round between two top 4 ranked teams. His team has record this season. Melendez is a former U16 international player as he played for the Mexican team six years ago. #7. Former U18 international point guard Cesar Molina (183-98, currently plays in NCAA2) couldn't help the Fort Lewis College (2-5) in their game against the Dixie State College in the NCAA2. He cannot count it as his best performance. Molina scored only 2 points in 13 minutes. his team lost 53-63 in St. George to the Dixie State College. This year Molina's total stats are: 2.6ppg and 1.2apg in 14 games. He used to play for the Mexican U18 national team five years ago.